New Batman: Arkham Knight release date - the truth or another rumour? Again and again the news about the Dark Knight’s adventures keep us on the alert. 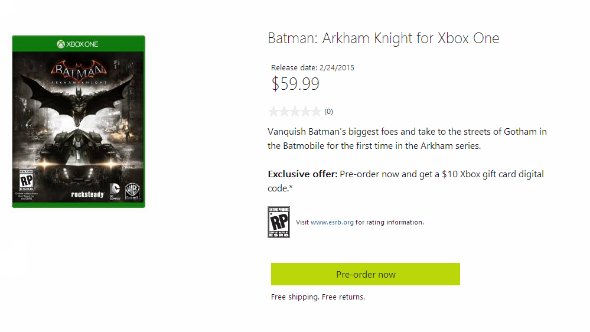 Thus, yesterday another probable Batman: Arkham Knight release date appeared. This time the leak of the information was caused by Microsoft company. Let us remind you that at the beginning of the previous week, in one of the interviews, Kevin Conroy, - the actor, who voices the game’s protagonist, - told us that the final part of the action-adventure series is supposed to be launched in January 2015. 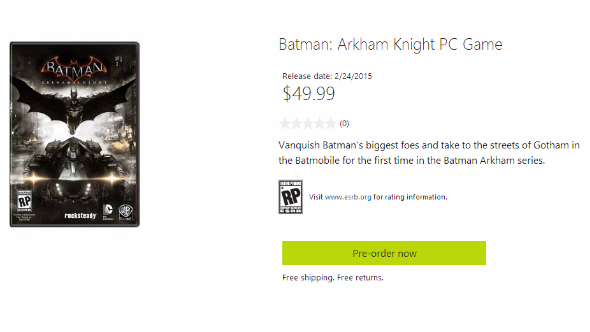 And yesterday, on the project’s page in the official Microsoft’s online store, the new Batman: Arkham Knight release date was published. And it’s February 24, 2015. For the current moment, it’s quite hard to say if this information is the truth, the mistake or just another way of calling the attention to the upcoming action-adventure. Well, the official confirmation hasn’t been given yet neither by the project’s developer - Rocksteady Studios, - nor by its publisher - Warner Bros. studio. Besides that, at the game’s site we still can see only 2015 without any specification of the exact date. Well, it seems like the only thing we have to do now is hope that the abovementioned Batman: Arkham Knight release date will be the final one. Though, our inner voice tells us that in the future we should expect more news about it. And what do you think? Share your opinion in the comments below.